The array and complexity of new financial regulation in response to the financial crisis can have unforeseen impacts. A reduction in the liquidity of the bond markets today compared to before the crisis is commonly explained as a result of increased regulation of the banking sector. A report by International Organization of Securities Commissions (IOSCO) in 2013 highlighted the impact of the regulatory push, following a G20 direction in 2009, for the OTC derivatives markets to be cleared through central counterparties (CCPs), thereby creating a potential for systemic counterparty risk (as per this post). The idea was to provide a centralised clearing point per asset class with the goal of increasing transparency and providing regulators with consistent data across borders to monitor. Benoît Cœuré, a member of the Executive Board of the ECB, said in a speech this month that “the gross notional outstanding amount of centrally cleared positions was estimated at $169 trillion for OTC interest rate derivatives, and at $14 trillion for credit derivatives. The sheer magnitude of these figures (around ten times the GDP of the United States or European Union) gives us an idea of the severity of the potential consequences from a stress event at a major global CCP”. Cœuré outlined a number of options for strengthening the financial resilience of CCPs including increased regulatory capital, initial margin haircutting, setting up cross-CCP resolution funds or a central resolution fund. Any such measures would have to be consistently applied across jurisdictions to ensure fairness and designed so as not to provide a disincentive to using CCPs. In March, the Bank of International Settlements (BIS) and IOSCO announced a delay until September 2016 for the introduction of margin requirements for non-centrally cleared derivatives (above certain thresholds and subject to exemptions). The proposed margin requirements are split between initial and variable, with the initial margin phased in from September 2016 to September 2020 and the variation margin phased in from September 2016 to March 2017. The amount of initial margin reflects the size of the potential future exposure calculated “to reflect an extreme but plausible estimate of an increase in the value of the instrument that is consistent with a one-tailed 99 per cent confidence interval over a 10-day horizon, based on historical data that incorporates a period of significant financial stress”. The required amount of initial margin is calculated by reference to either a quantitative portfolio margin model or a standardised margin schedule (as per the schedule below). The requirements also prohibit the re-hypothecation of initial margin required to be collected and posted under the rules. 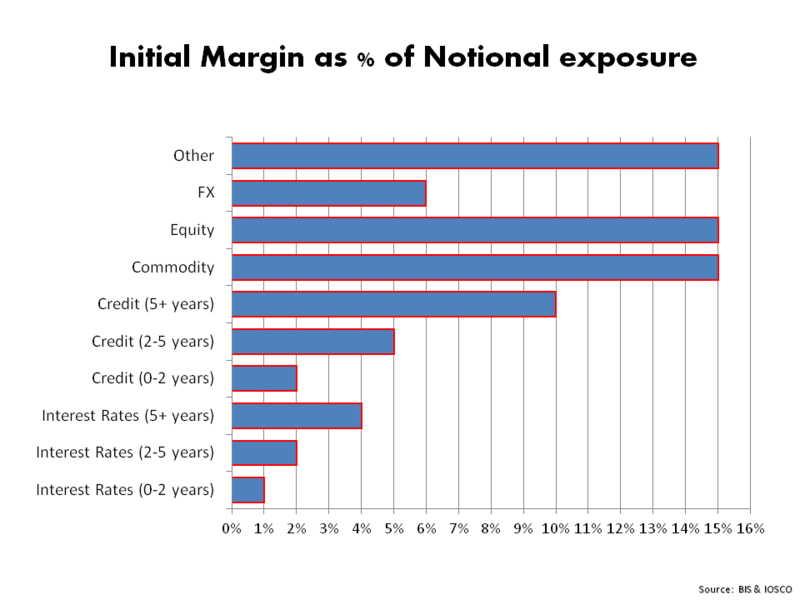 The amount of variation margin reflects the size of this current exposure dependent on the mark-to-market value of the derivatives at any point in time. As such, the volatility of this requirement may be significant in stressed cases, particularly for illiquid derivatives. The proposals, as set out by the BIS and IOSCO, are ambitious and it will be interesting to see how they are enforced across jurisdictions and the impact they will have on market behaviour, both within and outside CCPs. I suspect there will be a few twists in this tale yet, particularly in relation to unintended consequences of trying to tame the derivative monster.